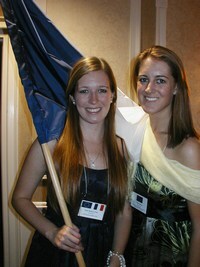 University of Lynchburg students, representing France, won five of eight top recognition awards at the Mid-Atlantic European Union Simulation in Washington, D.C., Nov. 18-19: Natalie Armel ’12 received the Outstanding Commissioner Award, Kaleigh Giles ’12 and Jillian Gates ’13 won Outstanding Parliamentarian Awards; David Warner ’12 (as President Nicolas Sarkozy) won the Outstanding Head of State or Government Award, and Kyle Ewald ’13 won the Outstanding Parliamentarian in Plenary Session Award. Sixteen LC students, led by Dr. Marek Payerhin, associate professor of international relations and political science, attended the simulation. This year some 160 students from 13 universities and colleges represented various member-states of the European Union. LC’s delegation was involved in debates of the European Parliament, the European Council, EU Commission, and the Council of Ministers. They also met with diplomats at the French Embassy and at the Delegation (embassy) of the EU.